Anyone ever deal with www.jimnysales.co.uk I'm really thinking of buying from UK ,,Ryan air over pick up and ferry home budget of £3000 2002 2003 year . All manual 70k mileage . Any advice gratefully accepted . Last edit: 01 Dec 2018 17:42 by Lambert. Reason: Swearing. Please remember this is a family friendly forum. mlines thanks for the intel. Probably THESE GUYS - theyre just up the road from me at Blockley, I discovered them completely by accident when I went to collect some Blockley tyres for my vintage car! I did approach them when I was looking for a convertible Jimny but they weren't very helpful and gave all the convertibles a thorough slating - needless to say I went elsewhere. Then only 5 months later they're selling two! JackonlyJack might be right about the autumn/winter prices being enhanced by the weather - its the same with convertible (sports) cars - they sell quicker in spring/summer at slightly enhanced prices. Last edit: 02 Dec 2018 18:08 by Max Headroom. 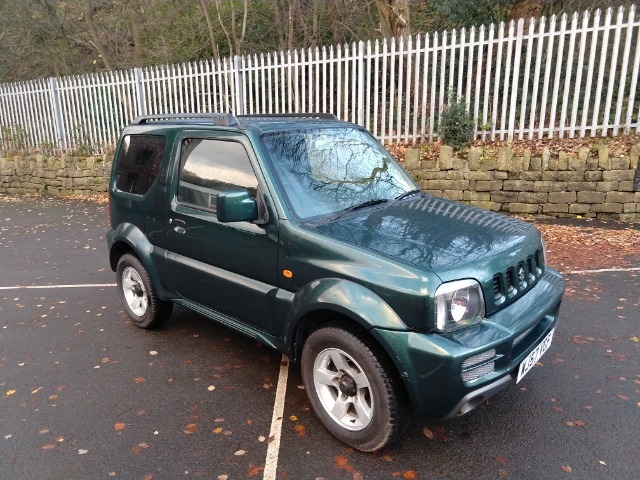 Max about an hour or two after posting my rant this came up www.donedeal.ie/cars-for-sale/suzuki-jimny-low-miles/20480958 only niggle is the 4wd is a button and not a stick. Spoke with the owner and he went out and checked the boot and behind the headlights and said yes a bit of surface rust but not structural and no holes. He's about 300 miles away £2580 = €2900 think we might have a Vooky for crimbo / Christmas . Its the same year as mine, and mine is a convertible and therefore far more prone to corrosion than a "conventional" bodied Jimny I would have thought. Nice colour though. I too would prefer to have levers and not buttons for selecting 4wd but have had no problems other than the led light on the 4L switch has failed. Check under the floor in the boot where the jack goes for corrosion, also its very difficult to get to see but I think try to get a look behind the headlights on a body mounting - take a mirror-on-a-stick and a torch to see around corners and difficult places. It seems very low mileage for the year. The engine is probably the M13a cam-chain job like mine which is ok but the g'box is likely the R72 so make sure its not making any 'orrible noises. You've probably already found it but check out the BigJimny Wiki and get clued-up on all that might relate to that vehicle. Looks nice from the few small (exterior only) pictures but better to see it up close in the real world and on a bright day. You never know - the interior might smell rank from 3 year old spilled milk or something! Last edit: 03 Dec 2018 08:33 by Max Headroom. Winter tyres fitted, new clutch this week, new kingpin bearings both sides. Oil and filter, air filter just done also. Drives well, everything works including 4wd.